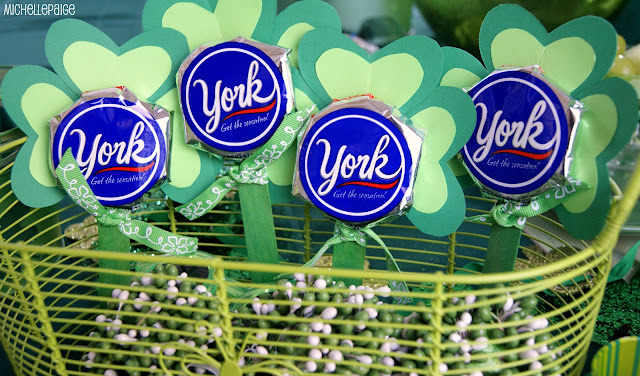 Let's make some festive Peppermint Pattie Pops! There's no need to turn on the oven to make these...don't you love that?! These are quick and easy and cute--perfect for a little teacher gift. and three light green hearts a bit smaller than the dark green. 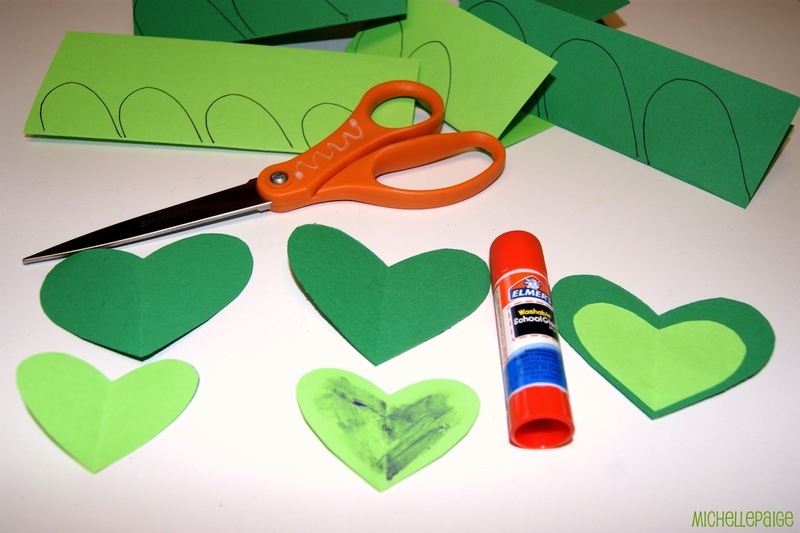 Glue the light green hearts and place them on top of the dark green hearts. We used full sized York Peppermint Patties, but you could make mini ones too. 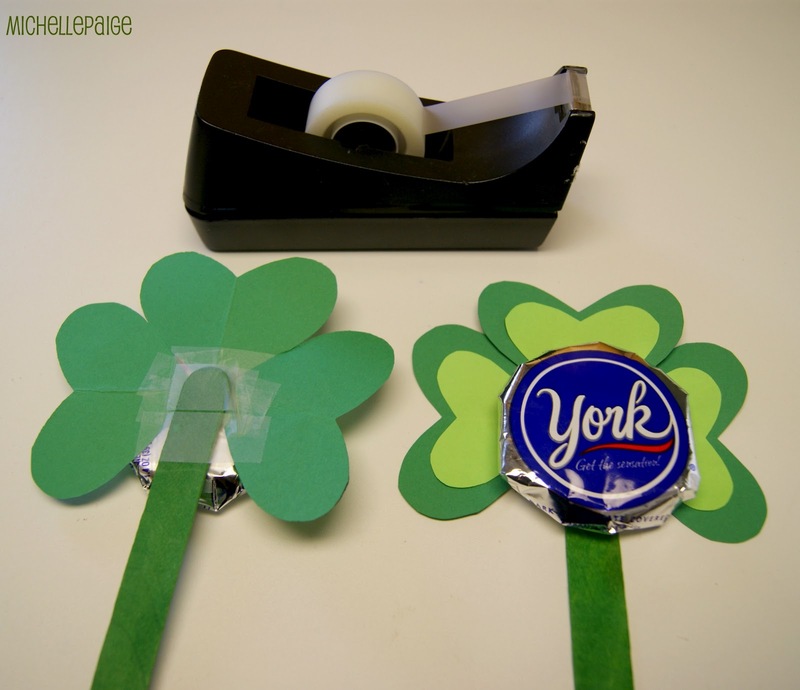 Fold the excess candy wrapping behind the peppermint pattie (so it looks round) and tape down. Tape on the hearts to the back of the pattie. Tape on a green colored craft stick (I found mine at Michaels). 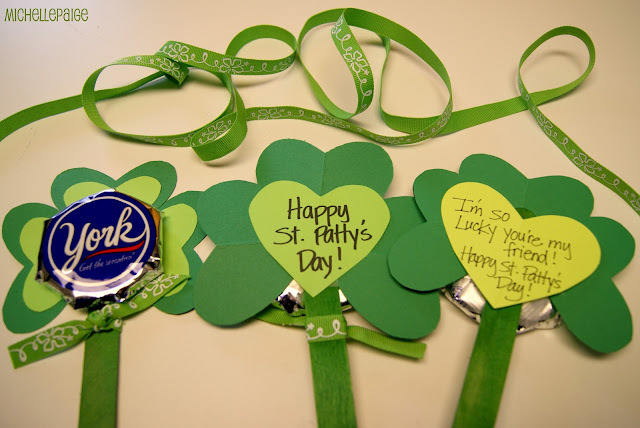 If you can't find green craft sticks, color or paint plain ones green. Tie on a bit of green ribbon and add one more heart to the back to cover up all that tape! 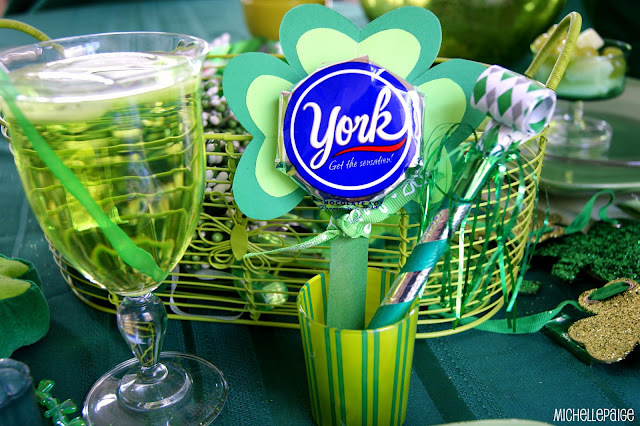 use them as place settings markers at your St. Patrick's Day meal. Don't forget to link up your Springtime Holiday ideas! Miss any of my March posts? Check them out! Girl, you are the clever one! Cute, cute! These are adorable!! I am definetly going to whip them up for my kids!! You have such great ideas! These are so cute! My 4-year-old would love bringing them to his friends at pre school. I would love it if you shared it at my link party! very cute:) making me crave peppermint patties...not good for lent. thanks for stopping by "my place" today. Totally super cute! Great party idea too. I love the table setting! The treats are such a cute idea! What a great idea!! I am your newest linky follower and I am super excited to be!! Would love for you to share these and other projects at my linky party going on right now and maybe become my newest follower! Love the simplicity of this project....no oven? Yahoo! These are so cute! I love things that play on words. I'd love it if you shared these at Whimsy Wednesday over at www.thenymelrosefamily.blogspot.com/2012/03/whimsy-wednesdays-1.html. Hi! Visiting from tt&j. What a great fun idea :) love it! Im going to poke around your site a little more. I would love for you to share this at my Friday link party!